It’s been a mild winter here in mile-high Central Arizona. The earlybird trees are breaking bud even earlier than usual: the elms, willows, cottonwoods. Also the flowering crabapple trees in town and around the mall. Things are stirring in the forests, too. I have been enjoying the blooms of the small but attractive flowers of the Manzanita shrubs in the hills just outside Prescott. Manzanita is a tough dry-site shrub that around here occurs frequently in the lower Ponderosa pine forests. Its leathery, dark green leaves are evergreen, persisting year round. Its reddish stems and branches are smooth and twisty and tough. It’s a tough plant, even though it has no thorns. Great wildlife cover. 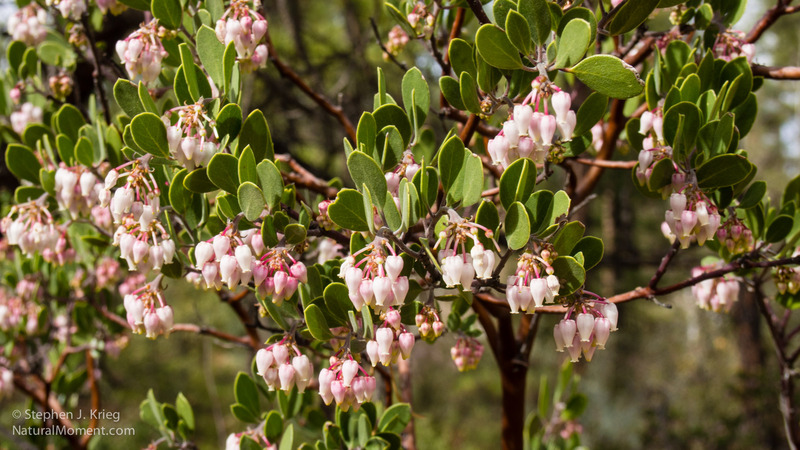 Manzanita blossoms are pink, sometimes white, being set off nicely by the dark green of their own foliage. They hang attractively in clusters. Photo location: Highlands Center for Natural History, Prescott, Yavapai County, Arizona. The Highlands Center is a nonprofit organization dedicated to ecological education in Yavapai County. Visit their website at www.highlandscenter.org.